Today Ali Edwards so inspired me with this idea on her blog: of making a Summer Manifesto, a list of everything one intends or hopes to do or squeeze out of their summer. I'm printing this out and sticking it by the front door, leaving some space for add-on ideas. May we all have a rich and full 'summer'! 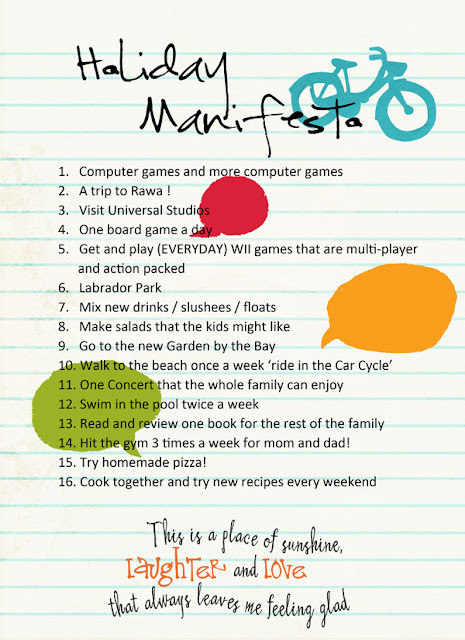 Thanks to your post, I've gotten the older two kids to fill out their Summer Wish List..We still have lots of school to do, but there's always time for fun! You have a beautiful and inspiring blog. Love your family photos as you build loving heritage moments. This wish list is a fantastic concept. Kudos. So nice to meet you.